Just over two weeks in, and it’s time for my family to report back on our experience of the Good Book Club. If you read my earlier posts, you’ll know that we were well-prepared and began with the best of intentions. We had the Bibles and the coloring pages and a printed schedule and a plan. We got off to a rocky start. I hadn’t counted on the fact that the first week of Lent is complicated in our family. Both my husband and I had Shrove Tuesday pancake suppers and Ash Wednesday evening service, so our family wasn’t at home together and we started the first week already behind. We spent the first few days playing catch up, which meant that instead of feeling grounded and dedicated I mostly felt like a scattered failure. But then something happened. The process of reading a little bit of the Bible each night and talking about it started working on us and in us. We started making connections. We began, of course, making connections with one another. 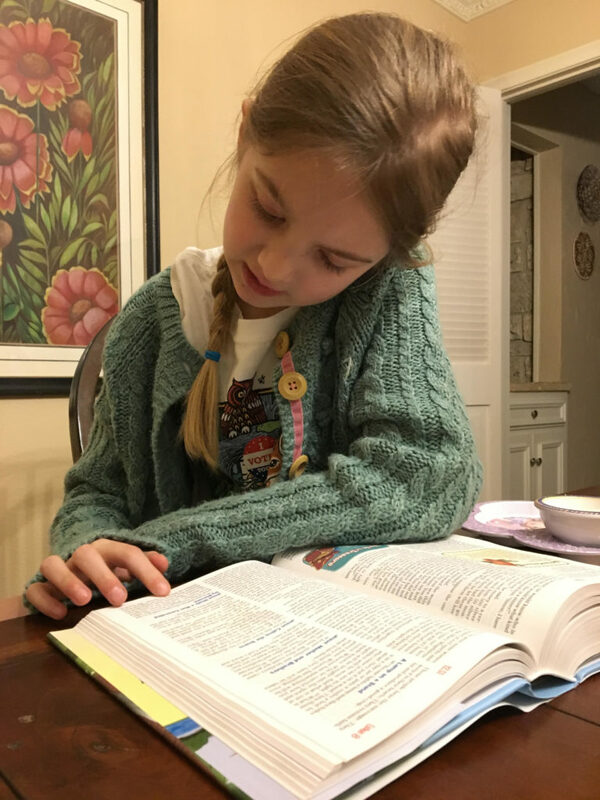 By having this ritual each night—by reading aloud from the Bible and coloring our daily squares on the coloring page, we were having a shared experience. For the rest of the day, we’d been going our own ways—my girls to their separate school classrooms and various activities, my husband and I to our different obligations at our churches. Often, even at the shared meal of dinner, we’d be talking about those different experiences, filling one another in, coming from different places. But in the Good Book Club, we’re coming to the same place. We’re sharing the experience of hearing today’s story read aloud and making connections over our wondering questions: “I wonder what part of this story you like best? I wonder what part of this story is about you?” Sharing those stories and that time of wondering has led us to connect to one another in a new way. In each of those instances, I had not even noticed the mention of angels when I was reading. I had to go back and look at what she might be talking about. 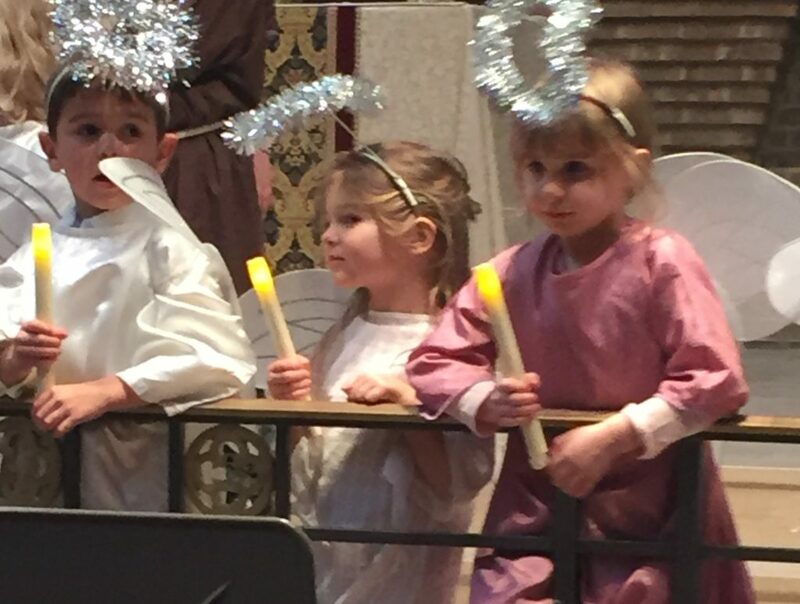 But my daughter, she’s listening; she’s catching every mention of angels, and she’s making connections between those stories and her own story. For her, angels are those who proclaim, “Glory to God in the highest, and peace to his people on earth!” And those words are not long ago and far away, those are her words, here and now. “Glory to God in the highest, and peace to his people on earth!” That’s what she is called and empowered to proclaim. I’m excited, as the days go on and we keep reading, to see what else she notices, and what other connections she makes. I imagine I will be hearing the line of the angels for weeks to come, perhaps every time angels are mentioned in the gospel. I’m guessing I’ll notice them in new places and spend some time wondering about what that means, since Adelaide will keep reminding me. And I imagine I’ll be surprised by what she notices next: something that I’ve overlooked, something I would have missed, but a connection that she’s teaching me to make. Is your family part of the Good Book Club? What are you discovering together? Such a great reminde of what others, especially children, can help us to discover and rediscover by sharing scripture together. The Power of coming together as family and reading out loud asking what message God has for each of us is awesome! Thank you for your sharing and good reminder for me and my family. Peace!